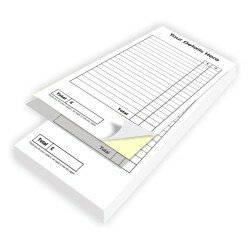 Restaurant Order/ Bill Pads are a great way to save time. Not only do you have a copy for your accounts you have a bill for your customer too. 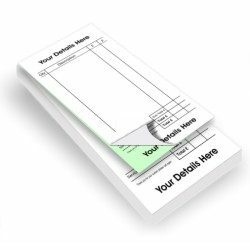 Our 2 part NCR Restaurant Order Pads / Bill Pads are available in DL format (1/3 A4) with White Top copy and a choice of Pink, Blue, Yellow or Green Bottom copy printed in black to the face of both sheets. They will be supplied in pads of 50 sets with flip up writing sheet and can be numbered if required. 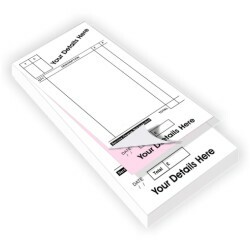 We have provided a range of templates for you to choose from, to which we can add your own details, logo etc. 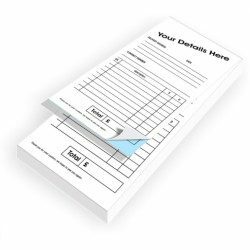 Other formats of NCR are available, such as A4 A5 & A6 in 2 part, 3 part and 4 part please see our NCR invoices page.